Last updated 05:25GMT, Monday 29 December. TODAY: snow A28 Switzerland. Fresh snow/freezing rain warnings across northern Germany. NEWS: see the latest on the Patras-Ancona ferry fire on the live blog (in English) at Enikos.gr. CHANNEL DELAYS: no delays overnight. WEATHER ALERT: red alert high wind Croatia. Amber alerts low temps/high winds Spain, high winds/snow Italy, Sardinia, Sicily, high winds Slovenia, Slovakia, snow Hungary, Serbia, high winds/low temps Bosnia, Montenegro, heavy rain/snow Greece. WEATHER: very cold and wintry. Heavy snow across North and South East. Heavy squally showers Mediterranean. WE’RE OFF TO BRUSSELS FOR A COUPLE OF DAYS. Wind, ice and snow threaten to play havoc with – for a change – carefully crafted plans. 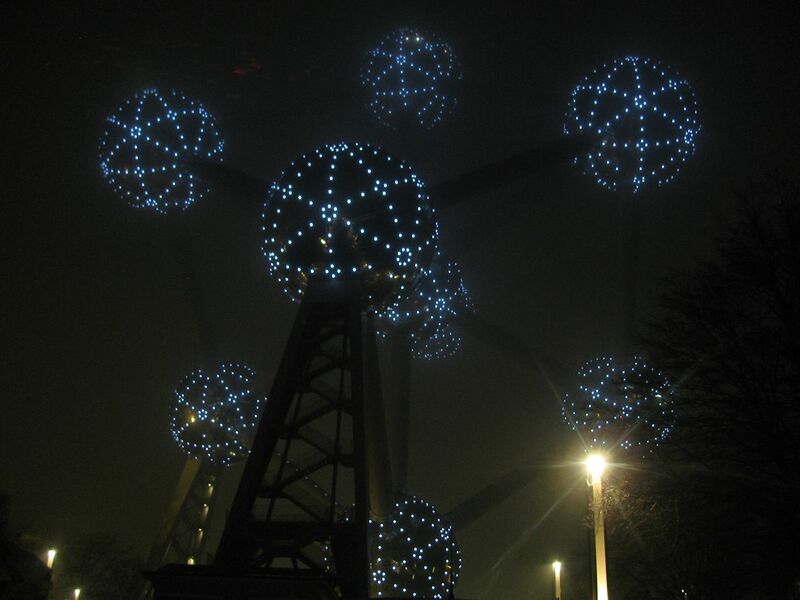 The Atomium, Brussels, through the windscreen. Photo @DriveEurope. The idea is to drop the Christmas dollars in the antique crystal shops around Brussels’ flea market in the Marolles. So this three day trip is an attempt to right that wrong though doubtless they will be over £1000 by now, we’ll baulk, buy some tat out of desperation and end up kicking ourselves again, this time for ever more. We also want to check out Hotel Amigo, just off Grand Place, because it’s so convenient for the centre and looks really swish. More broadly the idea is to finally get a handle on an important city that is, after all, closer to where we live than Manchester (for example) – at 225 land miles – and which we have driven past literally tens of times – on the R0 ring road – without ever getting to know properly. We’re also keen to put Rear View Mirror’s Best Chips in Brussels Guide to the test (staying at the Amigo and buying bloody wine glasses means we can’t afford to eat otherwise). On the subject of wild extravagance we’ve also booked first class tickets on the DFDS Dover-Dunkirk boat – the most convenient port for Belgium – to compare and contrast with the P&O premier lounge we tried in the summer. The way back will be an opportunity to explore Western Flanders, again a place we drive through on a regular basis without ever stopping. Particularly we’ll be looking for nice places to stay those times you cross the Channel late at night and need somewhere nice to crash close by to recoup for the megamiles ahead the next morning. See you on the other side. Back Wednesday. Enjoy the break.